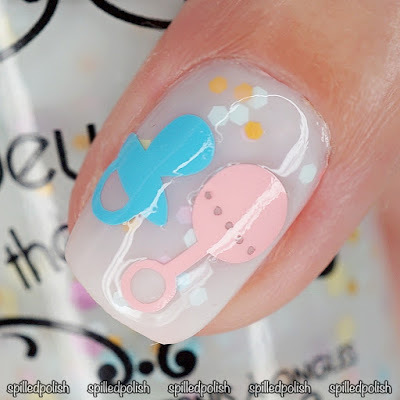 Ok ok, last baby themed mani (for a while) lol! I thought the mix of these two nail decals and the nail polish went very well together. I used three thin coats of Beyond the Nail – Wildflower Bouquet. When it was fully dried, I placed a Baby Pacifier Nail Decal & a Baby Rattle Nail Decal on my ring finger. I topped every nail off with one coat of PRO-FX – Quick Dry Topcoat.